﻿B﻿oondi Raita is one of the most traditional North Indian Raita. It is a delightful side dish made with a combination of yogurt and boondi. 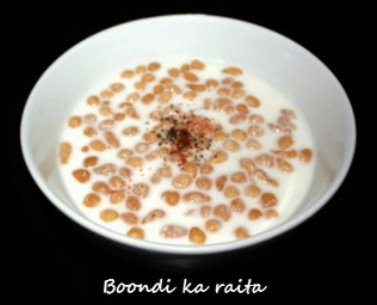 The word boondi has come from a Hindi word Boond means drop. Boondis are tiny deep fried balls of gram flour. Raitas are usually prepared with grated or boiled vegetables added to yogurt but boondi raita is different due to the addition of boondi. This yogurt generally accompanied with poories and aloo tamater ke sabzi (Potato and tomato curry). This raita usually prepare on festivals and weddings. 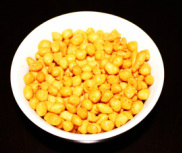 Boondi is a snack made from chickpea flour and easily available in Indian stores, it is become easier to prepare boondi raita, but boondi’s can be made at home. After frying the boondi they are soaked in hot water, so that the oil from boondi drains off and it becomes a healthy dish. 1. In a bowl whisk the yogurt. Add boondis and salt and mix them well. 3. Keep raita in the refrigerator untill boondis become soft. the hand beater for a minute or until besan become light and smooth. that means the batter is ready to fry, if it does not float then beat it little longer. turn the heat high, once oil heats up turn the heat down to medium. 4 “above the hot oil, fill a ladle with the batter and pour batter on the spatula. could be absorbed. Boondis fried very quickly. all the boondis are made. 8. Once all the boondi are made soak them in hot water until they become soft. of your hands to squeeze the water out and keep them aside. 11. Keep raita in the refrigerator and serve it chill.